Introducing The Camry Effect; a beige firestorm sure to leave you yawning uncontrollably for the rest of the afternoon. 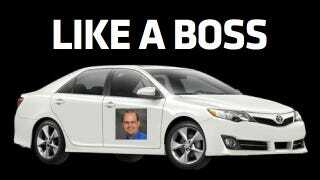 Anyway, Jim R — whoever the hell that is — is mighty proud of his 2012 Toyota Camry. Proud enough, in fact, to describe it as "boss," an adjective I mistakenly thought was reserved for awesome muscle cars. How wrong I was. Boss Toyota Camrys are, um ... Wait, what was I talking about? I started to nod off in the midst of writing that sentence. 2012 Toyota Camry: Beige is back! As I drive the road by the river in the rain, sheets of mother nature's frothy fury blast the windshield... but my '12 Camry handles it like a boss. The bumpy road undulates through the canopy of ancient oaks making lesser cars sway and shimmy... but my '12 Camry handles it like a boss. A quick left hand turn as the river meanders purposefully, cutting through the earth and whisking it's essence towards the delta. The car in front of me misses the turn and sails out and over the water. As I see the passengers scream and claw for the doors, my '12 Camry makes the turn with ease and I think to myself "Yeah, it handled that like a boss". What the hell?! Apparently, the beige has metastasized, gotten into Jim R's blood, and infected his brain. He's now having hallucinations involving his Camry and passengers in other cars dying horrible drowning deaths somewhere in Gondor or Rohan, we're not sure which. Fangorn Forest, perhaps? At any rate, Jim R chuckles to himself with self satisfaction as his non Camry-driving counterparts sink terrified into the icy depths as he drives away in serene comfort. But there are other stories from other equally boring and/or purposeless Camry owners. Toyota has done a fine job of trying to be all things to all people with The Camry Effect, a series of excruciating video and written testimonials where regular jackoffs babble aimlessly about this and that. The idea behind the campaign, from what I can tell, is that something, anything will click with someone somewhere. It's the scattergun approach to advertising an uninteresting but strong selling car. "Hey look, an Army sergeant! I know/was an Army sergeant!" Or, "Hey, if I eat more veggies instead of meat, I and my Camry-driving brethren will save 16 billion gallons of water!" There's even a guy with a purple donk '96 Camrizzle. Word. Why do I feel like a chick at a bar who's listening to a plain-looking, uninteresting man rattle off one ineffectual pickup line after another? Stuff a blown V8 into a new Camry, turn it into a giant, fire sword-spinning dragon — or something — and then we'll talk. For now, you have not penetrated the tough, critical skin of the boring car-averse Jalopnician. With what little brain function I have left after being subjected to The Camry Effect — in truth, my mind looks a bit like Camryman's Passing Lane right now — I'll recede to memories of my beat-up five-speed '83 Toyota Camry hatchback. It was a car that would connect with no one (save the handful of people who bought them back when Reagan reigned supreme) and looked faintly like a Delorean if you squinted real hard and had someone punch you in the gut.